We are a full service shop and offer a wide range of products and services. To see a full listing and description of what we can offer you, check out the Products & Services area in the Customer Service Section of our website. Just use our online estimate request form. Or if you prefer, call us at 320-485-2535. Many layout programs have collecting or packaging functions that will automatically collect your document, fonts, and artwork, and also includes a report. When possible, it is recommended to use these functions because if any of these elements are missing we will be unable to print your order. • Include all placed images• Make sure your files are set with proper bleed, trim, and safety areas. If possible, simply export or print the file as a PDF (portable document format), which takes care of the many elements listed above. Pictures and graphics pulled from the internet are often low resolution, typically 72 dpi or 96 dpi, which makes them faster to load in your web browser. Avoid these graphics, as they will appear pixelated and blocky when printed. Also note that you should save all photos in CMYK mode whenever possible. Images saved in RGB mode may not print properly. CMYK is a subtractive color model and is how full-color printing is accomplished (Cyan + Magenta + Yellow + Black will make Black); RGB is an additive color model and is how monitors display color (Red + Green + Blue will make White). For more information on color (and other printing terms) visit our glossary of terms. If you are unable to save your image in CYMK mode, please let us know. We have designers on staff that can help you out. Once resolution is lost (saved down to 72 dpi) it cannot be regained. A low-resolution image can not be made into a high-resolution image. A “proof” is a preliminary copy of how your document will be printed. This is the time for a final review of all text and graphics to make sure you will be satisfied with the final product. Pantone Matching System (PMS) assigns a unique number to each different shade of color. Designating a PMS number allows us to precisely match colors and maintain color consistency throughout the printing process. Monitors use the RGB (red, green, blue) color model. Printers use the CMYK (cyan, magenta, yellow, black) color model, which can reproduce most – but not all – of the colors in the RGB model. Depending on the equipment used, CMYK generally matches 85–90% of the colors in the RGB model. Keep in mind also that a computer screen is a back-lit device while printing is done on various types of paper. Color on paper can also vary considerably depending on the type of stock. Even room lighting has a large affect on how printed color may appear. However, in almost every case, color can be reproduced satisfactorily as long as limitations and processes are understood. Another resource to expand on this can be found here: RGB vs. CMYK. No, white is considered the “absence of ink,” and assumes white paper is being used. PDF (Portable Document Format) is the most common and preferred format. It also provides the most control in having your document print as it’s submitted. With the installation of a PDF print driver on your computer, virtually any program can generate a PDF file suitable for printing. Both commercial and free PDF print drivers are available online for download from various sources. Many jobs can be completed in 2 to 5 days. However, some may take longer, depending on their complexity and size. We always strive to provide an accurate estimate of the turnaround time for each job. Please let us know your expectations and we’ll do our best to meet them. “Variable data printing” (VDP) is technology for printing documents so that each piece is personalized to the specific recipient. This not only includes name and address, but many elements of a marketing piece for each recipient. Our sales representatives and designers can help you create a powerful printed piece. 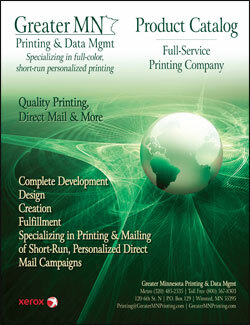 VDP is proven to get dramatically higher response rates than simple bulk mailings. Personalization is another term for “variable data” technology for printing documents so that each piece is personalized to the specific recipient. This can be as simple as a unique name and address on every printed piece. But more sophisticated levels of personalization can include text or images that vary based on data specific to the recipient, or data-driven graphics such as a pie chart illustrating something specific to the recipient. If you don’t see what you need, just call 320-485-2535 or email us at printing@GreaterMNPrinting.com.